Accrington Stanley Community Trust are on the lookout for a Company to become the principal partner of the Charity that delivers 30 community projects to over 17,000 people annually. This is a unique opportunity for a company to engage its corporate social responsibility by supporting an organisation that delivers positive change in our community. Our mission is to support the local community and promote a healthier lifestyle by encouraging individuals to take part in fun based activities, which develop confidence, co-operation and education, and your business can be a part of that. Whether you have a corporate social responsibility agenda to meet, employees to nurture and develop or you just want to give back and engage the community you trade in, we have the right programme for you. 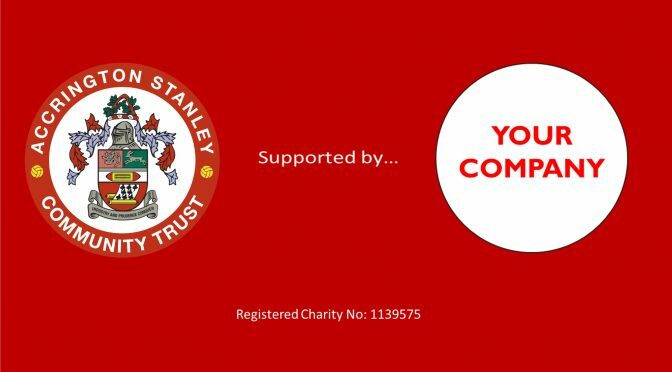 Be recognised as the principal Accrington Stanley Community Trust partner. Company branded Community Trust staff training wear. Press release to announce the partnership on the Trust and Football Club Website. Signed framed Accrington Stanley FC shirt. A photo shoot with the manager and two players of your choice at your company or the stadium. Branding to appear in the community pages of every match day programme. Feature in the community annual impact report. Full page feature in a match day programme profiling your support. For more information, please contact Martin Fearon, Chief Executive Officer at Accrington Stanley Community Trust; email martin.fearon@stanleytrust.co.uk or call 01254 304071.